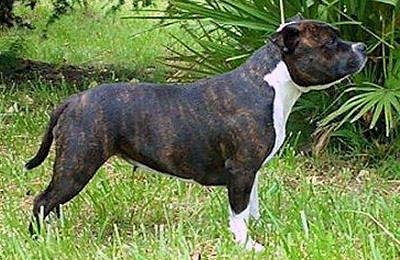 Mann is dark brindle & white young Staffie lady, she´s a daughter of the English stud-dog Ch. Donnellas White Treat. Mann have very friendly and calm temper. She shows a very beautiful head with a nice scissor bite. Her top-line and angulations are excellent. Her front shows a beautiful and strong chest with straight legs, excellent round bones and cat feet. She´s very harmonic and good mover. Mann is showed with big success and in age 24 month she end her championship with five titles. She has already four Cacib for international champion. Mann has won Best in Show 4 place, two times first place in Terrier Group, Best in Show Junior 2 place. She has won Specialty shows Best of Breeds in Latvia and Estonia and in International Dogshows. Mann continue in champion class. Mann will be mated at 2005 with English stud-dog, in case of interest, please contact via phone or e-mail.